It’s Day 28 of Art Every Day Month. Today’s painting is inspired by my family’s Siberian Huskies. Sadly our husky, Midnight, is no longer with us. She was a beautiful dog and like some huskies, had one brown eye and one blue. She was so loved and made such an impression, that my son now has a husky and my brother in law has two. Painted digitally in Paint Shop Pro and Photoshop. 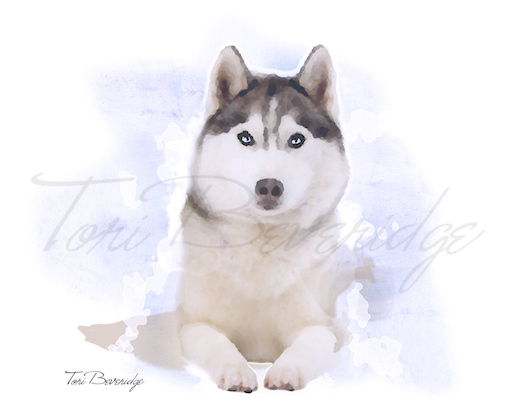 Posted in Tori Beveridge and tagged art, digital art, dog, dog art, Siberian Husky, Tori B. Your newest dog painting is as beautiful as the rest. Sorry your pup is no longer with you. Huskies are such gorgeous animals.